Make sure that the account you want to delete is logged out and also that you’re logged in to your Administrator account. 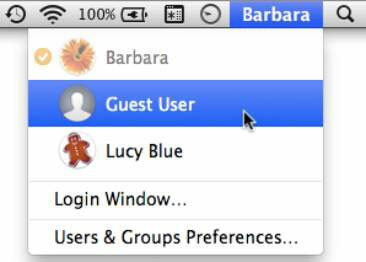 Choose Command→System Preferences, and then click the Users & Groups icon or click the Fast User Switching menulet and choose Users & Groups Preferences, as shown in this figure. If the lock icon in the lower-left corner of the preferences window is locked, click to unlock it, and then type your password in the dialog that appears. Press Return to unlock your Mac’s user account details. Select the account you want to delete in the accounts list and then click the Delete Account (–) button in the lower-left corner of the list. Save the Home Folder in a Disk Image: Saves the home folder and its contents in a compressed disk image (DMG) file. This keeps the files compressed, so they take up less space on the hard drive than if you choose the next option (which does not compress the files contained in the Home folder). Choosing this option is like stuffing things in an attic to get them out of sight but still keeping them around in case you need them later. Don’t Change the Home Folder: Keeps the Home folder and its contents exactly as they are before you delete the account, so you can browse through the files contained within the folder at any time. 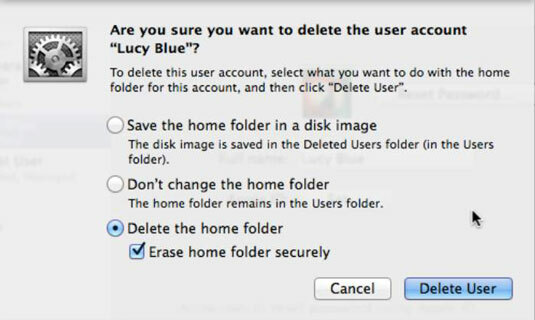 Delete the Home Folder: Wipes out any files the user may have created in the account. Click the check box next to Erase Home Folder Securely to encrypt the files when they’re erased, making them irretrievable. Your Mac deletes the specified account.